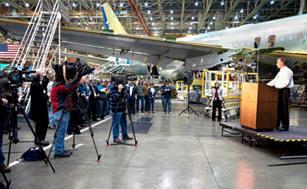 January 12, 2011 - Final assembly started on Monday on the 1,000th Boeing 767 airplane. Workers marked the milestone with a celebration at the Everett, Washington factory. Final assembly is the last step of the production process before the airplane rolls out of the factory on its way to the paint hangar and the Everett Delivery Center for ground and flight tests. "This milestone is a credit to every employee who had a hand in building 767s over the past 30 years. It is a testament to engineering a high-quality product that continues to improve through the years,? said Kim Pastega, vice president and general manager of the 767 program, Boeing Commercial Airplanes. The 1,000th airplane ? a 767-300ER (extended range) passenger model for ANA (All Nippon Airways) ? is the last 767 to complete final assembly in its current home. Beginning with line number 1001 ? also a 767-300ER for ANA ? all future 767s will complete that step in a new, smaller bay where production is scheduled to increase in 2011. The 1,000th airplane is scheduled for delivery next month. ANA, a long-time Boeing customer, has taken delivery of 89 767s since placing its first order in 1979. The Boeing 767 is a mid-size wide-body twin-engine airliner produced by Boeing Commercial Airplanes. Passenger versions of the 767 can carry between 181 and 375 passengers. The first wide-body twinjet produced by Boeing, the 767 was conceived and designed in tandem with the narrow-body Boeing 757 twinjet. Both airliners share design features and flight decks, enabling pilots to obtain a common type rating to operate the two aircraft. The 767 was the first Boeing wide-body airliner to enter service with a two-person crew flight deck, eliminating the need for a flight engineer. Following in-service indications of its twinjet design reliability, the 767 received regulatory approval allowing extended transoceanic operations beginning in 1985. The Boeing 767 versions have a range of 5,200 to 6,590 nautical miles (9,400 to 12,200 km) depending on variant and seating. The 767 has been produced in three fuselage lengths. The original 767-200 first entered into airline service in 1982, followed by the 767-300 in 1986, and the 767-400ER in 2000. Extended range versions of the original -200 and -300 models, the 767-200ER and 767-300ER, have been produced with added payload and operating distance capability. The 767-300F, a freighter version, entered service in 1995. Through the 1990s, the Boeing 767 became commonly used on medium- to long-haul routes, and the aircraft has ranked as the most commonly used airliner for transatlantic flights between the United States and Europe. There have been over 1,000 Boeing 767s ordered with over 990 delivered as of 2010. The -300/-300ER models are the most popular variants, accounting for approximately two-thirds of all 767s ordered. There were 863 Boeing 767s in service with over 40 airlines as of July 2010. Boeing will use the 767 as the platform for its NewGen Tanker if it wins the U.S. Air Force KC-X Tanker competition. That contract award currently is scheduled for early this year.